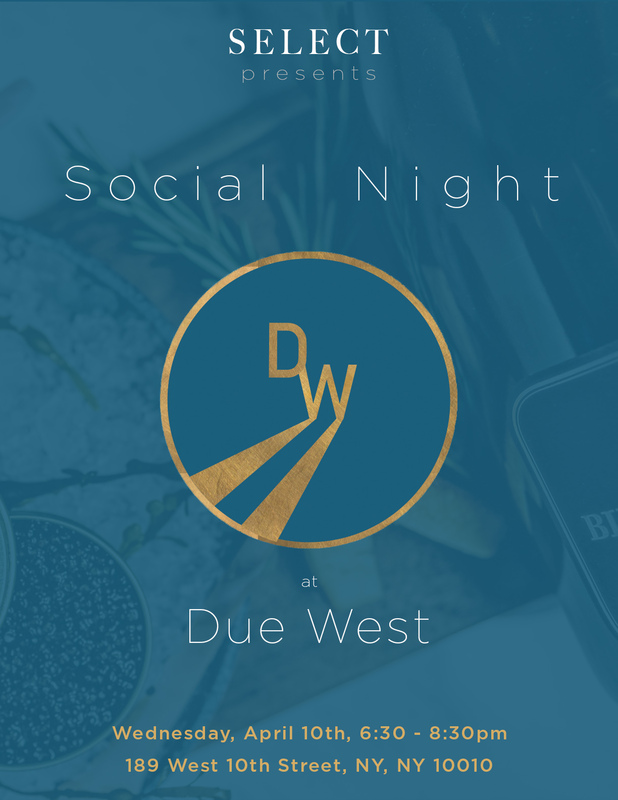 Join us on Wednesday, April 10th from 6:30pm to 8:30pm at Due West for an intimate SELECT gathering. Get together with the SELECT Community for a one-hour open bar of beer, wine, and two specialty cocktails starting at 6:30pm-- cash bar will be available for the following hour. This event is complimentary for Members, but capacity is limited, so don't forget to RSVP before space runs out. An intimate storytelling experience through a culture's cuisine. A celebration of all things rosé. A unique event celebrating fashion, sustainability and dance. ECT invites you to join us at Saxony Bar in celebration of Miami Music Week. SELECT presents special, discount access to Whisky Live, Washington DC's premium whisky exposition and tasting. SELECT is drawing back the velvet ropes to reveal access to two very special runway shows as part of the year's 2017 Style Fashion Week at the Pacific Design Center. VIP experience at the US debut of PHOTOFAIRS. Musical performances, shopping and open bar. Live painting and exhibition from artists Nenad Zaric and David Buckingham. Brunch & Networking brought to you by brunchwork. Holiday-themed open bar event with Capital Club. An afternoon of brunch, art, and jazz. Enjoy two hours of complimentary French wines, cheeses, and beer, as part of an exclusive happy hour at SELECT Partner Le Central. A night of cocktails, carousing, and live music. Silent auction, cocktails, dinner and dancing. Complimentary power yoga class and up to 25% off shopping. Private viewing and cocktail reception. Open Bar and cruise on the Potomac. Press Suite tickets and complimentary food and beverages. Live car painting with Skott Marsi.